As with most series finales, I was crying, laughing, and cheering. 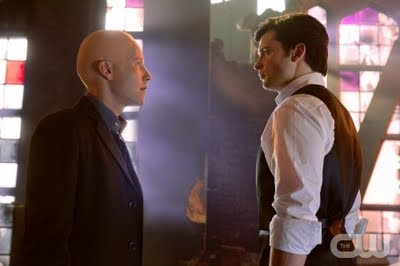 Familiar and well-loved characters returned, like Chloe (Allison Mack); John Glover as Lionel Luthor---or more accurately, the villainous Darkseid---shades of Lost's Fake Locke; and of course, Michael Rosenbaum as Lex Luthor. It was a defining moment to see Lex finally fully embrace his evil...ness. (Alright, this is a stretch, but much like Wicked's Elphaba during 'No Good Deed'). But like the Broadway musical's protagonists, Kent and Luthor did start off as friends, until their lives took them on different paths. What I wasn't prepared for, was that Lex's sister Tess (also new to me) would make him forget that Clark is Superman. Would that just make him go on a whole other, inevitable journey to evil--ry? Did Tess know how far her brother had descended into wickedness? It was interesting that she was still willing to take the chance and make the ultimate sacrifice by siding with Clark. I would have loved to see her character arc, fighting the Luthor dark side but ultimately redeeming herself by keeping Clark's secret. It was great to see John Scheider return as Jonathan Kent to join forces with Jor-El (voiced by none other than Terrence Stamp, natch) to make sure their son fulfills his destiny. How appropriate that his Earth father would hand Kal-El the Superman suit. Since I've missed the last 3 seasons, I was more than confused with some plot lines and characters. Who was the creepy old lady (Granny Goodness. Does Terry Pratchett know about this? ), and the two guys who kept referring to the Dark Lord? How did Voldemort get into this? But then again, it was enough explanation for me that it was simply a battle between darkness and light. Green Arrow even becomes corrupted by Darkseid, until Clark makes him see the light. He gets redemption by disposing of the minions with a single shot. With the brief action, there was drama, too. There's Lois and Clark's pre-wedding jitters, superhero relationship doubt/angst, their sentimental yet rudely interrupted wedding. As the end of the world approached, Clark in his Fortress of Solitude getting memorable flashbacks to tie up his journey to greatness. And now to complete this gushing geekfest, by gosh, he is Super in the TV-verse! Man of Steel indeed! He throws a whole friggin' planet named Apokolips! Now for those viewers who complained about not seeing Tom Welling in full Superman regalia, I actually liked that little tease because this was his story in Smallville after all. But I cannot say enough how much I loved the final scene where he's at the top of The Daily Planet building getting ready to save the world yet again, tearing open his white shirt to reveal that marvelous S as the Superman theme finally played! It actually brought tears to my eyes and I burst into applause. Fly, fly, fly my pretty! So thanks Smallville! Your last episodes soared.